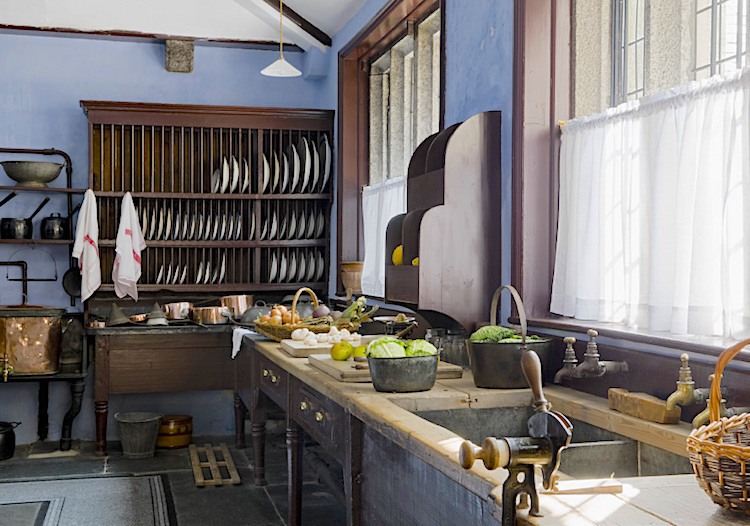 To fully comprehend the duties of the servants within the kitchen rooms of a Regency Era household, it is helpful to understand kitchen architecture and technology of the equipment available. It is a complex issue impossible to cover completely in one essay. Instead, I’ll give a nutshell synopsis with images for visual enhancement. First, it is vital to note that the food preparation area wasn’t one room but consisted of several distinct, separate rooms. The main room for cooking was the kitchen, of course. Attached or in very close proximity were two (or more) larders, storage rooms (pantries), the stillroom, the dairy, wine cellar, and the scullery. If fortunate, there would be an ice house on the grounds not too far away. The main kitchen was the largest room. 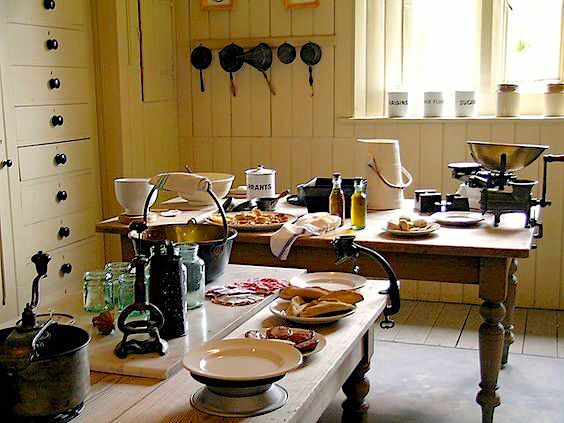 In extremely large houses there may be more than one kitchen, or, more commonly, the primary cooking area was divided into individual kitchens for specific menu items, such as a pastry kitchen for desserts. The kitchen was designed as a massive open square or rectangle, ideally with high vaulted ceilings and wide windows for illumination and ventilation. Built to be somewhat centrally located, the kitchen would have doorways or corridors to the adjacent rooms, and at least one exit to the outside. Kitchen gardens would be directly outside for easy access or as close to the kitchen exit as possible. Almost always on the ground floor, and occasionally detached from the main house for safety from fire hazard, the main kitchen layout must provide easy flow to the dining room for the swift serving of the meals. 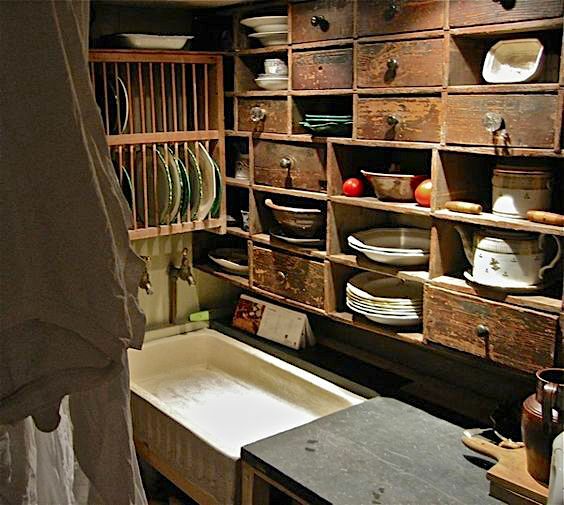 An additional benefit, especially in a busy household, was a “delivery-hatch” or “lifting sash or shutter” which allowed servants to retrieve the trays of food without entering the kitchen itself. Hot-closets or hot-tables were useful to keep the food warm until served. 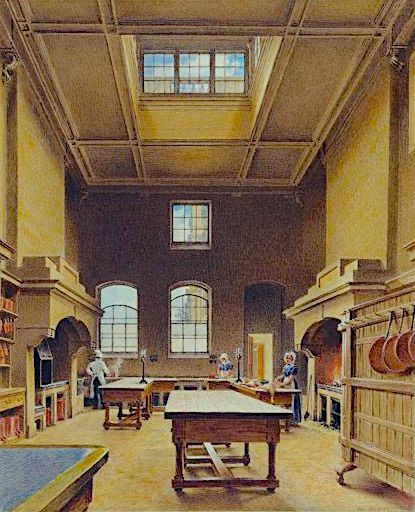 In primary structure, the early 19th-century kitchen and accompanying rooms were universally designed and largely unchanged from medieval times. Improvements were made to increase efficiency, but on a minor scale with major alterations not as often as one might suspect. The cost of renovating was always an issue, of course, but mainly, it was prohibitive to disturb the busiest room in the house with construction unless absolutely vital to do so. 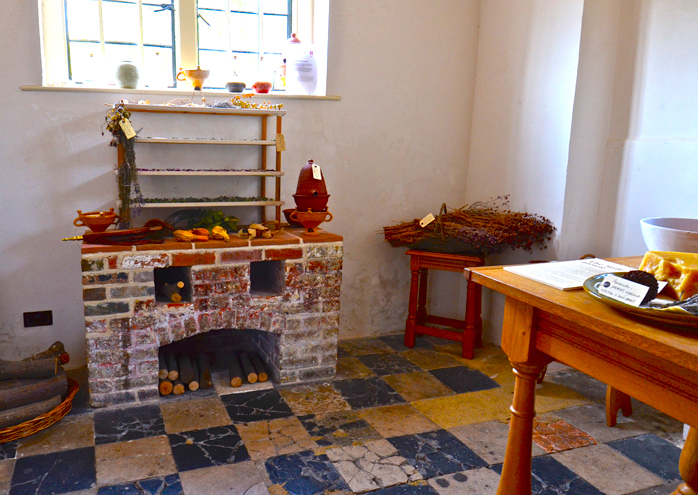 All the kitchen area room floors were wood, or preferably tiled, allowing for easy cleaning with mops and brooms. No vacuum cleaners, obviously, unless one counted the kitchen dog! Wood counter surfaces were the most common for cutting and other food preparation as it was inexpensive and could be easily replaced, washed down, sanded and reused. Brick was used for the stoves and hearth due to its superb ability to retain heat. Iron stoves existed but were in their infancy in construction and production. Wood was the primary fuel for smoking and cooking. Charcoal gained popularity and was kept on hand, but the flavors attained from the different types of wood was preferred. 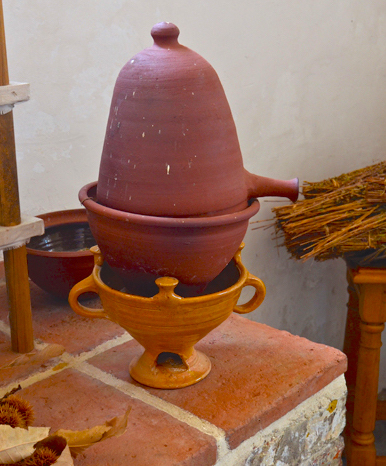 The primary cooking apparatus throughout the Georgian period was the fireplace. For best roasting-range, it was placed centrally on one wall, measured on average from five to eight feet wide with a depth up to three feet. Ovens and boilers were built into the stone, often with individual chimney flues and fire sources. A roasting-screen projected some three to four feet in front. Meals were cooked over open fires using spitjacks, standing toasters, and metal trivets. There were grates, hobs, and hooks with levers to raise and lower the pots over the flames, this being the only way to control cooking temperatures. Tomorrow I will talk about kitchen gadgets and utensils vital for the cooking process, so be sure to check back. Kitchen design and layout varied from house to house, although there were standards and recommendations for what was best. The image below shows three different manor houses from the mid-1800s. Examine each and note the similarities, as well as the variations. THE SCULLERY was always located in a separate room from the kitchen to prevent food being contaminated by soiled water. Specifics of bacteria were unknown, of course, but as in medicine, the evidence was impossible to ignore. Hygiene was essential. All surfaces, especially those for the preparation of food, had to be kept immaculate, meaning fresh water was constantly hauled inside. 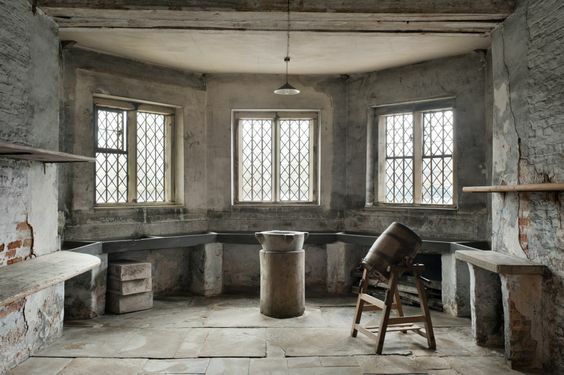 The scullery was equipped with double stone sinks where pots and pans and the servants’ crockery were rinsed and cleaned. The family’s fine china would be washed in a copper sink (the softer surface prevented chipping). A wealthy house might have a cistern above the sinks to flush the drains, pipes leading out of the house to the nearest garden. For this reason, sculleries were usually built next to the outer walls. No point in wasting the water! 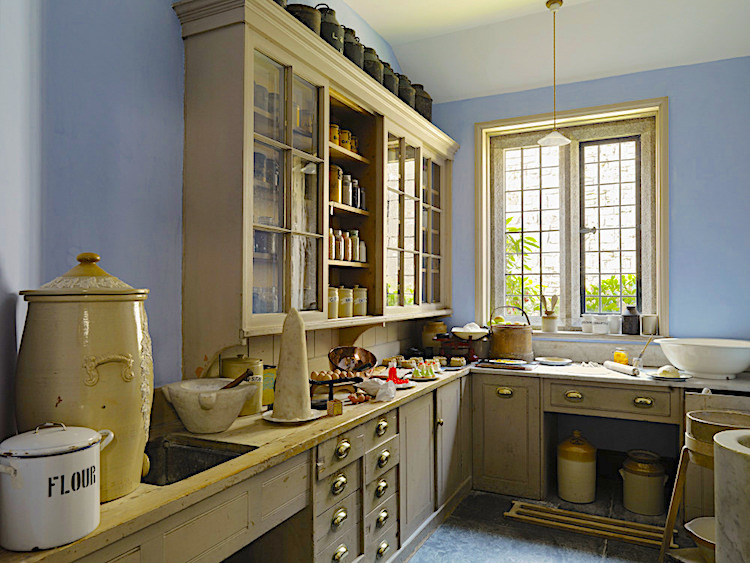 The Kitchen Scullery at Lanhydrock, Cornwall. THE DAIRY may have been attached to the house but often was a separate building located in a shaded area and situated so as to be sheltered from the harsh sun and strong winter winds. The barns would be a distance away to prevent contamination. Meaning the pails of milk were hauled to the dairy by the dairymaid, not an easy chore! Structurally, the dairy walls would be thick and covered with glazed tiles, plaster, or wood slats designed to resist water and regulate interior temperature. The dairy would have two, three, or maybe more rooms. One or more would be for storage and the curing of cheeses and creams. Two rooms, as in the main kitchen, were required to separate the dairy products from the cleaning room (scullery). Additional chambers for the dairymaid(s) quarters might be attached, or if separate located nearby, although this wasn’t always the case. Excellent ventilation and drainage were essential. Shelves and counters were preferably lined with or made from solid marble or slate for cleanliness and cooler surfaces. LARDERS were ideally located on the north side of a house to shelter from direct sunlight. A plentiful number of windows on all sides to provide excellent ventilation would be kept open with some sort of gauze covering for pest control, and latching casement glass during severe weather. 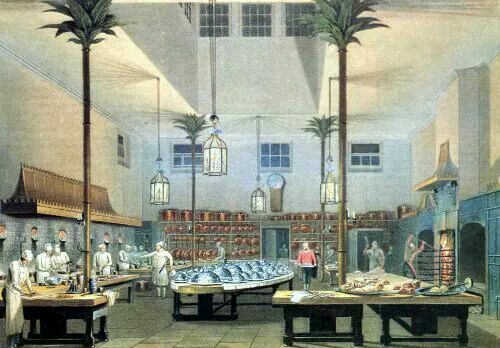 At the minimum, there would be two larders with ventilation, dryness, and temperature of the rooms the deciding factors for which foods were kept within. The Dry Larder at Lanhydrock, Cornwall. The dry larder, also called the cook’s pantry, stored the cooked meats, breads, pastry, milk, butter, and other assorted foods needed close at hand. Excluded from the dry larder would be any uncooked meats and unwashed vegetables. As the name implies, this larder must be free from damp with a constant airflow to remove any moisture, smoke, odor, or excessive heat. There would also be a drain in the floor to carry away collected water. Ideally, the dry larder would be located well away from rooms with high quantities of water, such as the scullery, laundry, or dairy. Inside the dry larder would be tiered shelves and storage cabinets with drawers. In the center of the room would be a large table or two, typically of wood with marble slabs on top to promote coolness. If an ice house was on the grounds, there may be a refrigerator cabinet with sections to keep chips of ice. The wet larder, also called the meat larder, housed all the uncooked meats: poultry, game, and fish. Maintaining a temperature as cold as possible was essential, therefore the walls would be lined with glazed tiles or non-absorbent cement. The floor would certainly be paved, and marble and slate slabs would be generously installed atop the shelves and countertops. 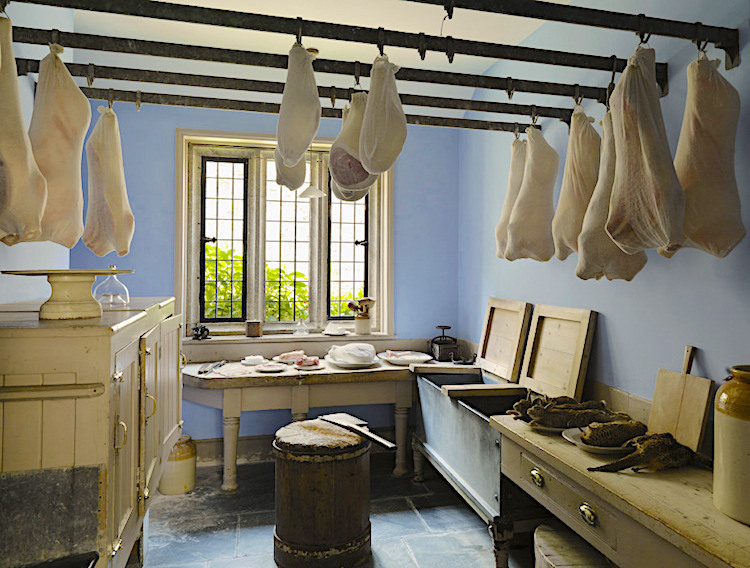 The Meat Larder at Lanhydrock, Cornwall. As in the dry larder, shelves and storage cabinets would be spacious and numerous with multiple compartments. Fruits and vegetables would also be stored in the wet larder, either in a designated section of the room or in an outer room separated slightly from the meats. Large households often had an inner room within the wet larder, a special compartment kept locked to protect the most expensive game meats. Meats would be hung from overhead sliding hooks and racks, as well as in ice boxes or ice-cooled refrigerators. Along with the big table in the middle of the room, there would be a device to weigh and balance the meats, and several huge chopping blocks. These two larders were the basic essentials for adequately designed kitchen rooms in a country manor house. A superbly stocked grand house that hosted important visitors and lavish parties would often boast additional special larders. Rather than one wet larder, there might be a separate fish larder, poultry larder, and game larder. A pastry larder would be used exclusively to make and store pastries (and the ingredients for the pastries: flours, sugar, lard, etc.) in a location close to the kitchen for the required warmth and easy access to the ovens. There may also be a confectionary, an amplified pastry larder for the creation of elaborate desserts and sugar forms. Salting rooms were necessary if salting meats were done frequently. This room would require stronger shelves and tables with lots of movable trays for pickling. It would also need abundant space for pots and barrels to brine meats, as well as a water source and drainage. Bacon larders were fitted with special racks for bacon strips and cured hams. Lastly, the smokehouse was often a separate structure but might be an attached room, with hooks and bearers to hang the meats. The fireplace was usually situated outside of the chamber, the smoke from the burning wood, sawdust, or peat funneled into the smokehouse, flues controlling the escape of the smoke from the roof. THE STILL ROOM was a dedicated workplace for the household distillery. Typically a room (or rooms) in close proximity to the kitchen, sometimes the still room was a detached structure near the service area of the manor house. Arguably one of the most important rooms for running a proper home, the still room was essentially the kitchen chemistry lab for a vast array of products from food to medicinal. As I noted in the essay on the housekeeper and female servants, the woman (or women) who staffed the still room were highly skilled and educated. In many cases, particularly prior to “modernized” industrialization of medicines and chemical production, the lady of the house was as skilled in still room recipes and techniques as the servants assigned to the task. Daughters of the family also trained in the still room, the skills a valuable need to run one’s own household and thus an asset in the marriage market. Each household kept meticulous records passed on from generation to generation with “recipes” for every imaginable concoction, these journals prized possessions. Women of the household were responsible for the health and well-being of the family, servants, tenant farmers, and to some degree even the animals. The still room was a truly multi-functional area. The list of products directly associated with creation in the still room is phenomenal. Read the list below and I think the concept of needed more than one room to do it all — as well as the vital importance of the area and the staff — will become clearer. Jams, jellies, relishes, syrups, etc. The room was, in many respects, a mini-kitchen. Equipment would include a still, of course, along with a small oven and fire cooking area, a brazier or other type of tabletop boiler, a sink or two, and several tables, storage closets, and shelves. 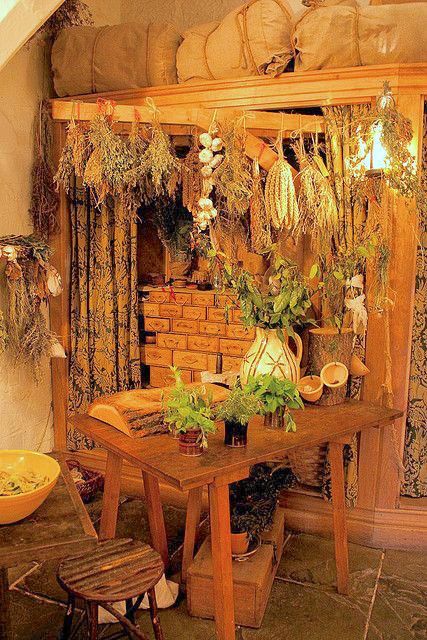 The ceiling would be outfitted with multiple hooks and racks for hanging herbs. As a keeper of records, the room would require a desk with superb writing implements, as well as secure cases to safely store the ledgers. Distilling is the process used to produce high-alcohol content products. Indeed, this was applied to home-brewing ales, beer, wine, and other spirits for drinking. It was also the process by which medicines, essential oils, cleaning products, preservatives, cosmetics, and the like are created. Fermentation and pickling were essential for preservation in this largely un-refrigeration period. The knowledge to adequately preserve food was critical. Herbs, flowers, roots, and other organics grown in the gardens and foraged from the surrounding countryside were dried, treated, preserved, and stored in the still room. For more images of Georgian era kitchen rooms, visit my Pinterest Board dedicated to the topic. Examples have a Georgian aesthetic and *mostly* period-correct fixtures. I say “mostly” since photographs are a modern capturing technique so even English manor houses attempting to preserve the Georgian era appearance are never exactly correct. ← From Cook to Scullion. Can There Be Too Many in the Kitchen? One Comment for Georgian Era Kitchen Room(s). Yes, more than just one room! Wonderful site – really enjoyed reading your contents. I was wondering if you had any information on what Stuffing spoons and Straining spoons were really used for – they are massive spoons, some of them 14 inches in length.